M1 Performer’s Age is reckoned as on 31st August in the year prior to the Festival and will be strictly observed. M2 The adjudicator’s decision is final. M3 Time limits must be strictly adhered to. Performers who over-run will be penalised by the loss of one mark per minute or part of a minute. M4 “Own Choice” titles do not need to be notified on the Entry form. “Own Choice” pieces must conform to the standard of tests set at the Festival and the Committee reserves the right to refuse a piece, in the Class, that is not of the required standard. Titles of “Own Choice” music must be announced. M5 An original score of music, not a photocopy, of an own choice piece must be in the room. A copy of own choice music must be handed to the adjudicator at the beginning of the class, and in the “Set Piece” Classes the prescribed edition and key, where specified, must be used. Failure to do either of these will mean that the Performer will receive an adjudication but no mark. M6 Performers may not enter more than once in a Class unless specified. M7 Entrants are advised that the Festival no longer engages official accompanists. 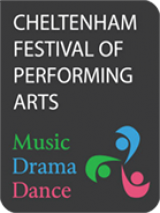 M8 Performers in “Own Choice” Classes may not offer items with which they have already won prizes in Cheltenham Festivals in the past 3 years, nor may they enter the same piece in more than one Class. M9 Backing Tracks, whether CD, Tape, or other media are not allowed unless specifically allowed for a Class. M10 SONGS FROM THE SHOWS: Performers are reminded that due to Performing Rights no costume or scenery may be used. Movement is allowed. M11 For music classes split into ‘a’ and ‘b’ sets: Each set will be adjudicated with 1st, 2nd, 3rd places and medals. Only one cup will be awarded overall. Performers: The Festival cannot legally allow anyone to play/perform from photocopied music. A person performing a work at our Festival in front of an adjudicator may make one photocopy for the adjudicator provided that the performer has already purchased an original copy and that the photocopy made is retained and destroyed by the adjudicator immediately after the performance. IMPORTANT: This permission only applies to the Adjudicator copy and all other copies used for the performance (e.g. by the performer and/or accompanist), including any copy made by electronic means, must be legally purchased originals. The Festival has to be strict with this regulation. You are asked to comply with it to avoid unpleasant situations.